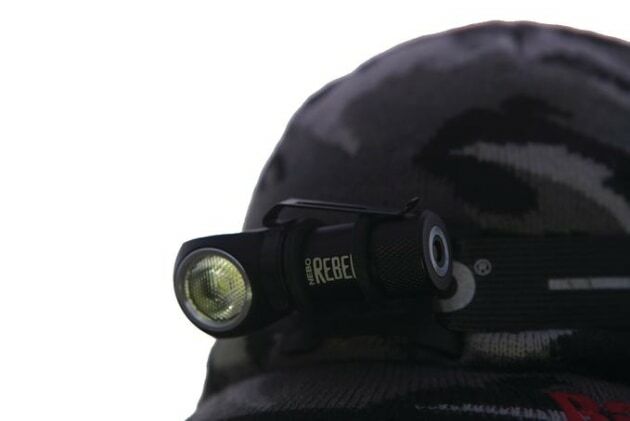 The Rebel headlamp from Nebo was surprisingly compact and very light at 85 g.
Nebo sells over 6 million units per year of its innovative L.E.D lighting products; everything from torches, lanterns, headlamps, pocket lights, even keyring lights punching over 200 lumens. Sheldon and Hammond Pty. Ltd has recently taken on the brand for distribution in Australia. As luck would have it a good friend happens to be the brand manager and sent me a little present in the mail to test for a few months. At first glance and feel, the Rebel was surprisingly compact and very light at 85 g. The body of the actual light and battery felt very strong, being made from aircraft aluminium finished in an anodised black, which has proven well against the elements so far. Now a word of warning...don’t be like the kid who looks down the hose to see where the water’s gone while his older sibling turns it back on. Yes, I turned it on while looking at it and can vouch even the lower 200 lumens of the four available settings, going up to a whopping 600 lumens, was damn bright. During a cod trip fishing in the black of night with no moon and no other discernible light, we were faced with trying to find camp for a few hours of sleep. The turbo mode at 600 lumens lit the nearby bank up like it was daylight, akin to having a good set of spotlights on a car. Very impressive from a tiny headlamp. I’ve had a lot of headlamps over the years and most are either, bulky and heavy or the head strap tends to creep up the head and requires pulling down every few minutes. I couldn’t fault this headlamp for the first few times...that was until the battery went flat. It’s the only negative I found. When the battery is low there is no dimming or warning, it just turns completely off. On a positive note though, it’s easily recharge-able via USB through an iPhone wall or car charger and takes a maximum two hours to get full charge again. Other noticeable features are the magnetic base so it be detached and placed on the boat gunwale or car for fixed lighting and it’s water and impact resistant which is a big plus in my book for outdoors use, especially fishing and hunting. In a total unbiased opinion this is the best headlamp I’ve ever used. It’s a great headlamp for fishing at a great price at about $69.95.